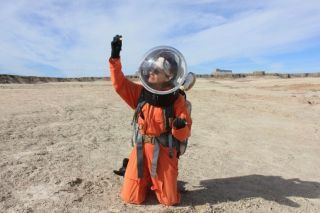 Mars 160 crewmember Annalea Beattie examines a sample on an EVA in the Utah desert. There's no sound in the desert in the early morning, no birds fly by. This morning, there's nothing. It's so still. I am awake in my loft in the roof of the Mars Desert Research Station (MDRS) in the Utah desert. It's 6:30, and I'm thinking about people I love who live on the other side of the world and about what might happen if I really did go to Mars. I'm also wondering about my art-based research and the challenges for today's field-science EVA (extravehicular activity). This morning I'm going on a science-sampling EVA to two different kinds of hypolith sites. As well, I'll be doing some geological field drawing in the spacesuit. While on the surface of Mars, fieldwork during EVAs will be key to scientific exploration. On our mission, the goal is five science EVAs a week, at three to four hours on average each. The amount of research, planning and writeup both before and after each EVA is phenomenal. Nothing is left to chance. What we really want for the field science is efficiency on the EVA, as there are hazards out there, even in simulation. With the goal of enabling more effective planning of fieldwork, Australian geologist Dr. Jon Clarke is conducting an EVA operation analysis in conjunction with Dr. Bill Clancey from Stanford University, California. By documenting the process during the two halves of the Mars 160 mission, Jon will collect data on the stages of the EVA to investigate how this process actually works, from the emergence of the idea that provides the EVA goal, through its initial stages of planning and execution, to the processing and analysis of preliminary results, then from data return and laboratory analysis, through to publication. Jon says the conduct of EVAs is vital to the effective performance of field sciences. The field scientist, such as a geologist or biologist, works in a different way than a scientist in the laboratory. The systematic generation and testing of hypotheses are less important than the collection of meaningful observations that allow the data to be placed in context. For instance, the significance of a piece of granite differs, depending on if it occurs as part of a massive outcrop or as pebbles in a conglomerate. It's the importance of context that separates field science from lab science. In the lab, the context is standardized (standard solutions, pressures, temperatures, atmospheres), to universalize the subject being studied, such as a chemical reaction or a physical process. For example, one of Jon's personal projects looks at the exhumed and inverted channels near the MDRS as analogous to landform conditions onMars. He has investigated these extensively during previous visits to MDRS, both in and out of simulation. Now he is using his prior experience to not only study the science but science operations that support it. Jon says, "On an EVA while in a spacesuit, many of the standard methods of the field geologist either can't be used or take much longer. Places you can scramble to normally can't be reached for safety reasons. You can't use a hand lens to study the rock, for example, or sight through a compass or clinometer. Working around these challenges on the EVA helps define the tools and processes needed for planetary field science on Mars." Mars 160 crewmember Jon Clarke on an EVA in the Utah desert. Yesterday the EVA gave me my first opportunity to test out geological field drawing in the new spacesuit. Jon Clarke set me a task, and I sat in an ancient, partially exhumed channel (Jurassic, about 175 million years old). I drew an outcrop of cross-bedded sandstone with a conglomerate top. Annalea Beattie makes a geological field drawing during an EVA. This morning I'm looking forward to my EVA where the goal of my second field test is to draw fluvial patterns in another dried creek bed and then give the drawing to Jon as blind data. We want to see what he can understand from the field sketch in comparison with documentation of the same site through photography and mapping. But today's drawing experiment on the EVA was never going to happen. After breakfast, the daily briefing, the science briefing and then the EVA briefing, it was necessary that our engineers tackle the problem of adjusting my spacesuit so that I could drive the ATV (all-terrain vehicle) with ease. Yesterday, while driving, somehow the backpack continued to push my helmet and my neck forward, decreasing vision and causing strain. Our crew engineers spent a while addressing this problem, with me in the full suit. An ATV is necessary for field trips in the desert. On every EVA while driving, we stay on scheduled tracks, as the ATV vehicles easily damage the delicate desert crust. Driving in the spacesuits is a necessary skill for the EVA. These machines are basically huge, four-wheeled bikes that can be dangerous and hard to reverse if you are wearing a suit because you can't turn your head without difficulty. Mars 160 crewmembers stick to established trails while riding ATVs, to avoid damaging the Utah desert's fragile crust. So far, all of our EVAs have run like clockwork — but not today. Science operations have to be perfect for us to leave the hab, but even astronauts on the International Space Station (ISS) have human error and continually meet problems with technology. EVAs in space have had to be cancelled because it's not safe to proceed. But, as sometimes happens, we sort out one problem and another takes its place. Our engineers noticed that although the backpack fit was better, the fan that pushes air through the backpack into the helmet of my spacesuit sounded irregular. Again we were delayed as everyone worked to resolve this second problem. In this case, a decision was made that I could proceed with the EVA, but not too far in the field. I had to remain close to the hab because of the safety risk. In terms of safety, apart from the basic medical training, EVAs require our crew to be trained to deal with all kinds of emergencies. For instance, part of the EVA training here for the second phase of our mission in the Arctic Circle is gun training. At the Flashline Mars Arctic Research Station, we will have a designated person to carry a gun on every EVA. This person will not be in simulation mode. On a field trip in the Arctic, bears are a real danger. I keep thinking of the five besieged Russian scientists locked in their research facility for two weeks in September with 10 adult polar bears and their cubs at the window. While the team was waiting to be rescued, the bears ate their dogs. On this morning's EVA, after a number of hitches, we finally manage to get out of the hab. Our crew engineer and crew commander watch out of the hab windows as we complete half an hour's practice ATV training. Annalea Beattie in her EVA spacesuit. It was at this point that the battery charge on my suit died. The fan stopped working, and, immediately, the helmet fogged. If the fan switches off inside the helmet, you basically rebreathe your own air, and there is a buildup of water vapor and carbon dioxide as oxygen depletes. When the air can't escape, it quickly gets very hot and you start to puff. Within two minutes I'm back in the decompression chamber. By the time decompression is over, so is my EVA. I'm disappointed and I'll try to re-schedule as soon as I can. At least I went outside. To follow The Mars Society's Mars 160 mission and see daily photos and updates, visit the mission's website here:http://mars160.marssociety.org/. You can also follow the mission on Twitter @MDRSUpdates. For information on joining The Mars Society, visit: http://www.marssociety.org/home/join_us/.